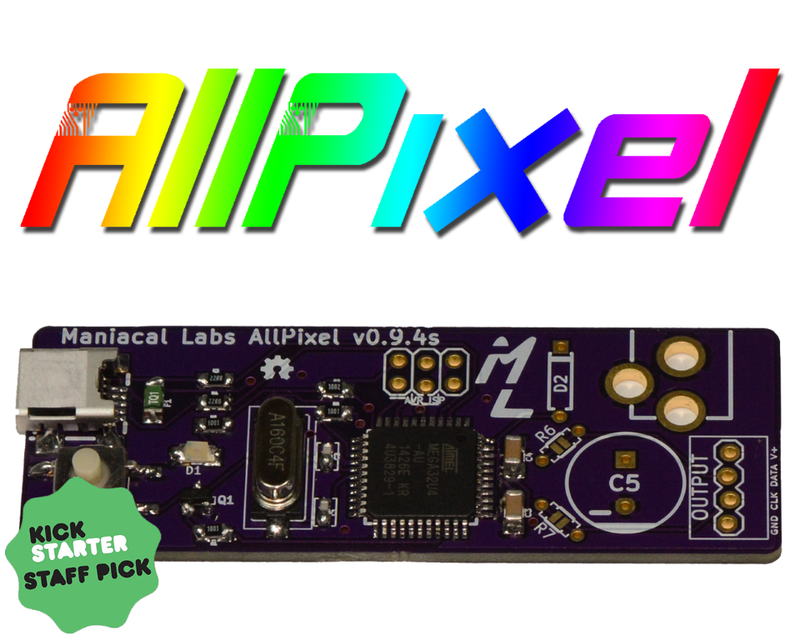 It’s been a long, long journey bringing the AllPixel to fruition and it is finally coming to the end… But now the real fun begins as the AllPixel finds its way into the hands of LED hackers and hobbyists! The Kickstarter backer rewards have begun shipping out and, once those shipments arrive, the AllPixel and PowerTap will be available for general sale on the Seeed Store. We’re shooting for availability within the first two weeks of April. While you wait, be sure to checkout the AllPixel Quick Start Guide and the BiblioPixel Wiki so that you can dive right in as soon as they are available. Once you have an AllPixel, check out the Maniacal Labs Forum if you have any questions, or would just like to show off what you’ve made. We would love to see what everyone comes up with so please don’t hesitate to share on the Show-And-Tell sub-forum! If you want to be notified as soon as the AllPixel is available, be sure to sign up to be notified on the AllPixel page.